Laurent Clerc was born on the day after Christmas in 1785, third of five children. He became deaf at one year old; family legend said it happened after Laurent fell into a fire. When he was twelve he entered the Royal Institution for the Deaf in Paris, directed by Abbé Roch Ambroise Sicard. The Royal Institution was a large residential school providing education for deaf children from all over France, and was free for the children of poor parents. Instruction was based on the French system of sign language. Clerc’s first teacher was Jean Massieu, who was himself a graduate of the Institution. Clerc was a brilliant student, and in his twenties became an instructor of advanced classes. In 1815 Clerc went with Massieu and Abbé Sicard to London to exhibit the Institution’s educational methods, which were a revelation to English-speaking audiences — and in particular to a visiting American clergyman named Thomas Gallaudet. Gallaudet had come to England to learn about education for the deaf in hopes of setting up a school in Connecticut. At Sicard’s invitation, Gallaudet accompanied the Frenchmen back to Paris, where he spent some months at the Institution. When he grew homesick for Hartford, Laurent Clerc agreed to return with him and help him set up a school and be its first teacher. Clerc never said why he decided to volunteer; maybe it was for adventure. Gallaudet and Clerc worked out a very careful contract, one that guaranteed Clerc freedom of religion (he would be a Roman Catholic in a staunchly Protestant and often anti-Catholic society) and a payment and travel expenses even if the school scheme didn’t work out. On the long trip across the Atlantic, Gallaudet learned sign from Clerc, and Clerc learned English from Gallaudet: he kept a lengthy diary in which he describes learning his new language. The school did work out. The demonstrations that Clerc and Gallaudet gave in New England, like those that Sicard conducted in Europe, amazed audiences. Because so few deaf people received any education, and because sign language (except for a family’s own personal sign system) was virtually unknown in America, many people assumed deaf people were incapable of rational thought, much less fluent and eloquent expression of ideas. The Connecticut Legislature supported the school, as did many influential and wealthy benefactors. Among Clerc’s first pupils were many who would become well known in the history of the deaf community in America, including John Brewster, a painter, who was fifty-one years old when he came to the school; Mary Gilbert, daughter of a prominent Hartford attorney and parent advocate; and the beautiful and brilliant Eliza Crocker Boardman of New York — who would become Clerc’s wife. Clerc revisited France several times, but returned each time to Hartford. He eventually became an Episcopalian. 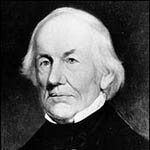 Though he retired from active teaching in 1858, he went on consulting, meeting with deaf groups throughout New England, and writing on issues important to deaf people. He died in 1869. Republished from: John Crowley, “Monsieur Laurent Clerc,” Disability History Museum, http://www.disabilitymuseum.org/dhm/edu/essay.html?id=39 (January 27, 2014).